In A LADY'S CHARADE, my initial setting is at fictional South Hearth Castle, which I based off of Berwick Castle on the border of England and Scotland (will post next week! 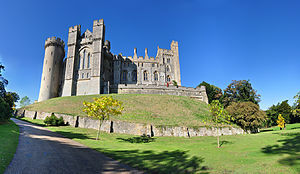 ), the rest of the book takes place at Hardwyck Keep, based off of Arundel Castle, which is this week's castle. *A note! I came up with the fictional town of Hardwyck seven years ago when I began planning the book. It was until a few years ago when working on a non-related Tudor project I found out there was a Hardwick Hall--quite beautiful, but is not in any way related to my fictional town. 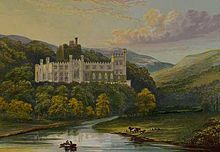 Arundel Castle was established in 1067 by Roger de Montgomery, built in West Sussex--named the first Earl of Arundel by William the Conqueror. Throughout the years it became the main family seat for the Dukes of Norfolk. The castle overlooks the River Arun and was meant to be used as fortification against the French. Originally, the castle was built as a motte and double bailey--which I love. This is when the keep sits atop a man-made or sometimes naturally made hill, as extra protection against invasion.There is a walled inner bailey directly in front of the castle, then below that a second outer bailey also walled. The castle has been restored and is open for visitors. The interior is beautiful with period pieces and paintings, and outside you can enjoy a tour of the The Collector Earl's Garden. In this era, the castle has been used in numerous productions such as The Young Victoria, Victoria and Albert, Antiques Roadshow and Henry VIII. Showing the castle atop the motte and the baileys. A drawing of the town in 1644. Enjoy a video tour of the castle I found on YouTube!